Over-sized vegetables. When a seed name includes a size descriptor, I expect big things. GOLIATH parsnips and Oregon GIANT snap peas were the big winners this year. I will plant these same species again next year because they were awesome tasting and enormous. The zucchinis were also over-sized, but that was more about gardeners choosing to ignore the small zucchinis until they were larger than human toddlers. Bees. This year was a good bee year with over 100 pounds of honey harvested. Each of our two hives had their own personalities. The bees close to the raspberries were docile and not at all bothered when I came close to pull weeds or water. The bees close to the favas were very feisty and kept flying into my hair when I would walk close by. That hive always had a huge cloud of bees flying around and above. Even though my hives returned to Langley a few weeks ago, my garden is still full of honey bees, so I think there is another hive in a nearby garden. The meadow experiment. The man replaced some of the lawn areas with wildflowers, using seed mixes from West Coast Seeds. This was very successful and he is going to convert more of our existing lawn to meadow next year. Raspberries. 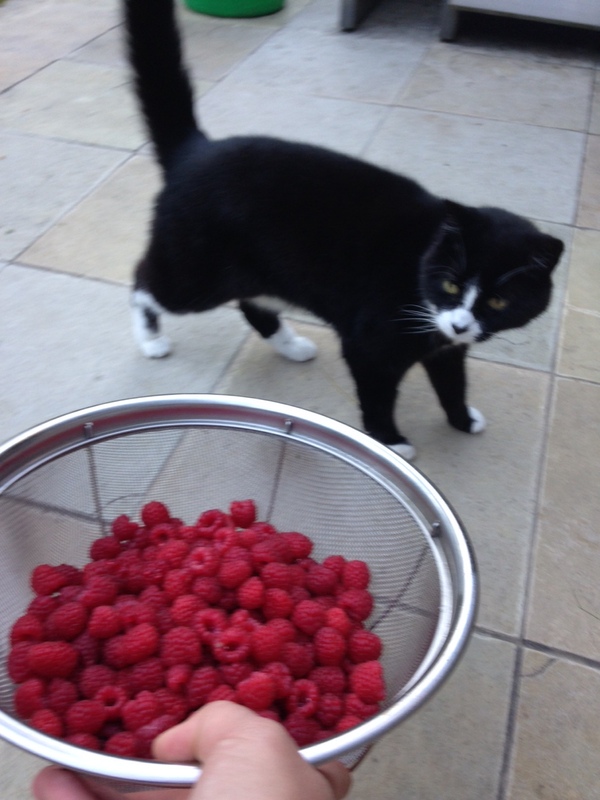 This was the BEST year ever for raspberries. Instead of making jam, I froze most of them for gelato. I also made a huge bottle of raspberry vodka. Raspberries infusing in vodka. After 6 weeks in the dark, I filtered the berries out. 6. White begonias and cosmos. Normally I am not a white flower person and prefer something a little more vivid. 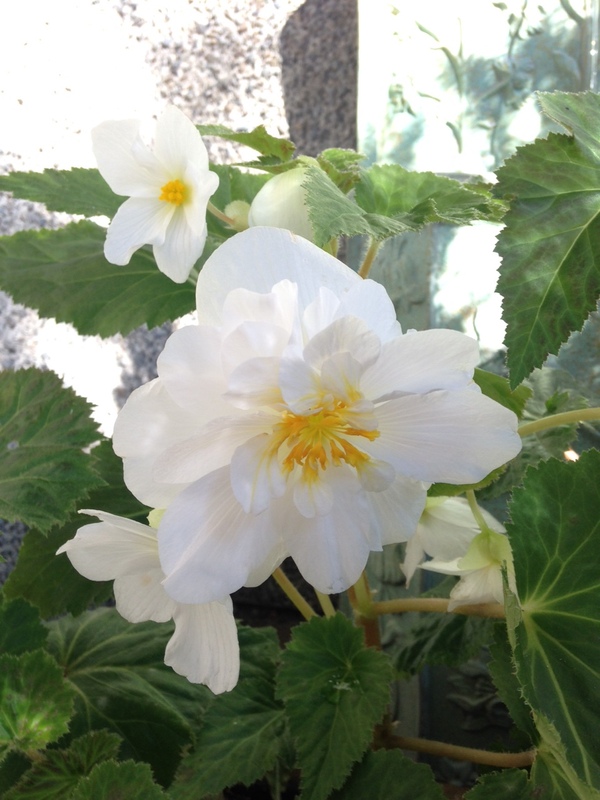 The white begonias I planted in my planter on the shady front deck turned out gorgeous and perfectly proportioned for the space. The white cosmos I planted last year ended up reseeding themselves across the entire front garden. They are tall and a bit spindly, but I don’t care. 7. 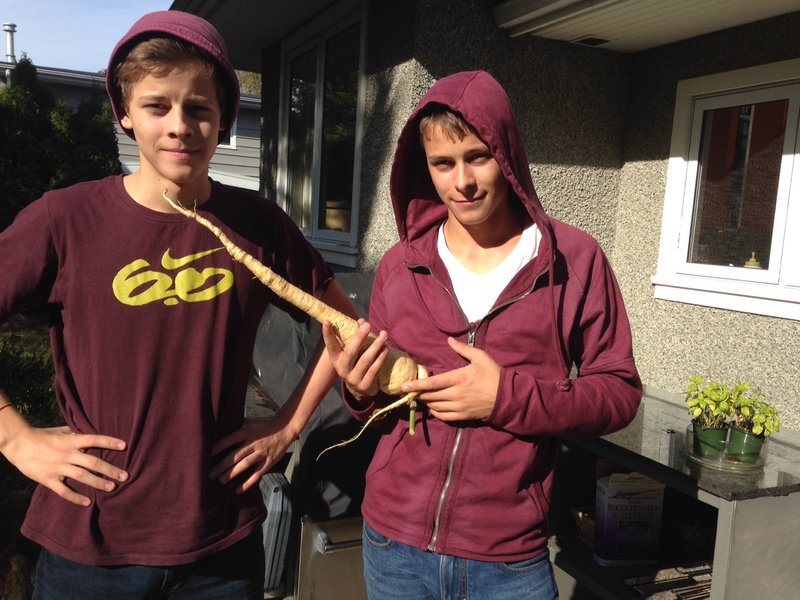 Kale and chard…but not too much. This year one row of chard and two rows of kale were just about perfect for our family. I’ve doubled the amount for winter since they grow so much more slowly when it’s cold. 8. Water barrels. The barrels helped our vegetable garden survive the drought. We’re getting more in place before next summer. 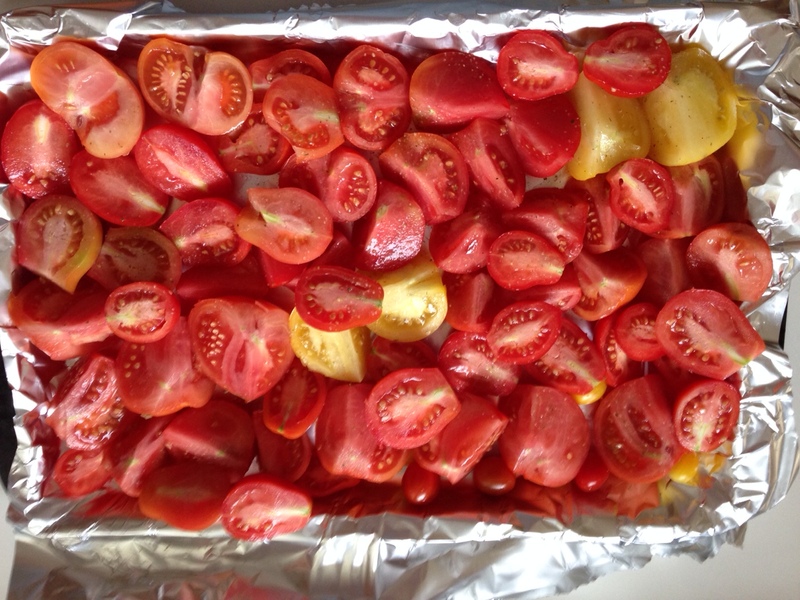 Megan’s tomatoes about to go into the oven. 9. Other people’s tomatoes. This was a fabulous year for my friends’ tomatoes. Thank you Megan and Elizabeth for generously sharing your fabulous tomatoes with me. 10. Potatoes, garlic, green beens, arugula, pears and apples…all were abundant and we grew enough to share. This fall I am going to double the amount of garlic planted. Aphids. I don’t like to use any pesticides. When the aphids showed up on the fava plants, I thought “Oh! Part of nature and are good food for ladybugs”. Not a single additional fava bean pod developed from that point forward and so the fava harvest was only half of what it should have been. On the bright side I figured out that the best point at which to freeze the beans was after they were out of the pod but before the skin was removed. Frozen beans can be dropped directly into boiling water and then the skins are can be slipped off before the beans are added to the paella. Lettuce. This was the WORST. YEAR. FOR. LETTUCE. At least in my garden. It grew, but every thing ate it except for me. Tomatoes. Nope, another year of bad tomatoes in my garden. I guess that doesn’t matter if all my Tomato Goddess friends share. Chafer beetles that infested our lawn and were picked out by racoons. Boo. The boulevard of shame. If you’ve visited our house or happen to be our next door neighbours, then you know exactly what I am talking about. Wasps. They thrived in the dry weather. What a beautiful, bountiful summary! Loved all the photos — sooo cute with the kitty and sooo colourful! I also thought the bee info was fascinating — feisty or not — I can’t imagine 100 lbs of honey. Thanks Ingrid, neither can I! Luckily for me, Bryn and Art process all the honey and I just get a few jars. And thanks for the things that didn’t do well – my tomatoes were a disaster this year. Reading your list helped because sometimes I feel like a gardening failure all by myself in my backyard. Nice to know I have company! Happy planning for 2016! Thanks for the link to the lacewings. I didn’t know about them, but will definitely consider them for next year. I tried ladybugs this year, but with limited success. You have one of the nicest gardens that I have admired from afar…even with tomato disasters!